This outfit optimizes femininity, beautiful, strong and confident. The strong lines of the leather jacket, the caged effect of the heel, combined with the soft, delicate flow of the skirt and plush fold over clutch are the perfect combination of naughty and nice. 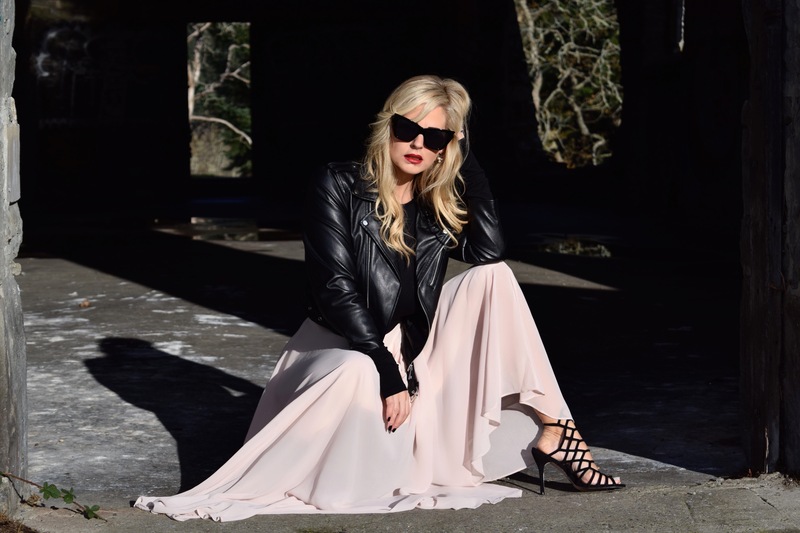 This gorgeous pale pink maxi skirt is my first online purchase from Morning Lavender Boutique and I am thrilled. It arrived very shortly after I placed my order and there were no hidden costs. The packaging itself was fantastic, they even pop a sprig of Lavender in it, my skirt still smells fantastic. The fabric has a good amount of weight and falls beautifully. I am 5’8 and it was the perfect length for me. I wore it with flats the other day and had no issue with it dragging. As far as fit goes I would say it fits true to size, however, if you want it to sit a bit higher on the waist I would try a size down. I am already looking forward to my next purchase, I highly recommend you check them out. Isn’t this location stunning, my husband was the one who found it. There are so many hidden gems in every city. When you start looking through a camera lens the world seems to just come alive in a different way. 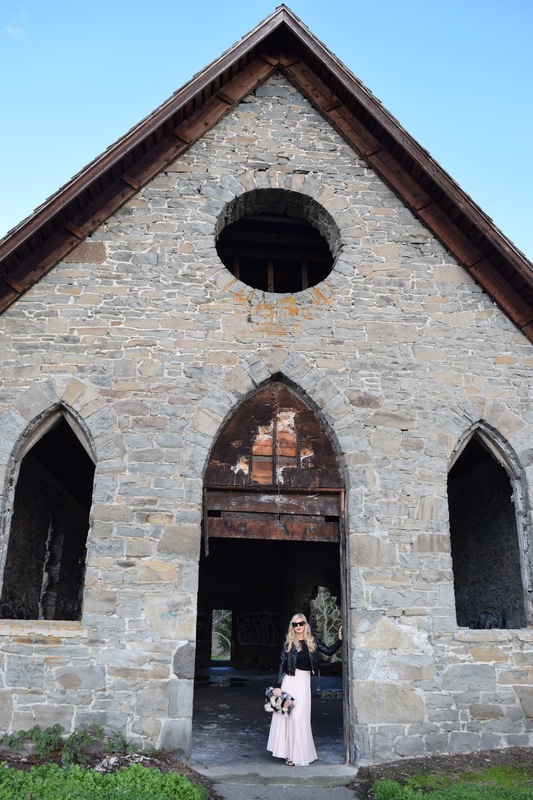 This Old Stone Butter Church is located on Comiaken Hill in the beautiful Cowichan Valley and dates back to 1870. The church only congregated for 10 years before it was abandoned for a new location. It is now whispered by valley residents to be a hot spot for spirits. To this day the First Nations will not go near it because all who actually built it died mysteriously. “Over the years I have heard the whispers about the Butter Church that have given it the Spiritual respect that it deserves. Night time visits to the Butter Church on dark cloudy nights have echoed stories of strange sounds, eerie feelings, cold spots, and feelings of being watched, and even still to this very day, those stories of unexplained and supernatural occurrences at the Old Stone Church continue to echo in new voices.” Cowichan Artist Joe Jack. Maybe all those spirits were whispering in my ear that I was a ballerina and made me believe I could bend without breaking. Let me say this much, I am paying for it today. This was however, the perfect ensemble to twirl around in. My top is from Free People and it is one of those pieces that is on constant repeat. I adore the low back and the fact the fabric is quite thick, makes going braless okay. Yes, another leather jacket. I may have mentioned this before but I have a slight addiction to them. This particular beauty is from Zara, the strong zippers and belted details make this piece pop. It may be faux leather but I did not care once I put it on, it fits like a glove. The slightly shorter sleeve creates a peek-a-boo effect and the option to be belted or casually open, makes it a very versatile piece. I am wearing a medium which I found true to size, even worn done up I still had room to breath. Not to forget two very important items on todays hit list, this amazing fold over fur clutch and perfect pair or strappy heels by Steve Madden. Are you in search of a unique clutch that grabs everyones attention? Well we have a winner, I am not going to lie, it does receive comments, some very opinionated ones at times. My advice for you is, put on your big girl pants and strut your unique you. 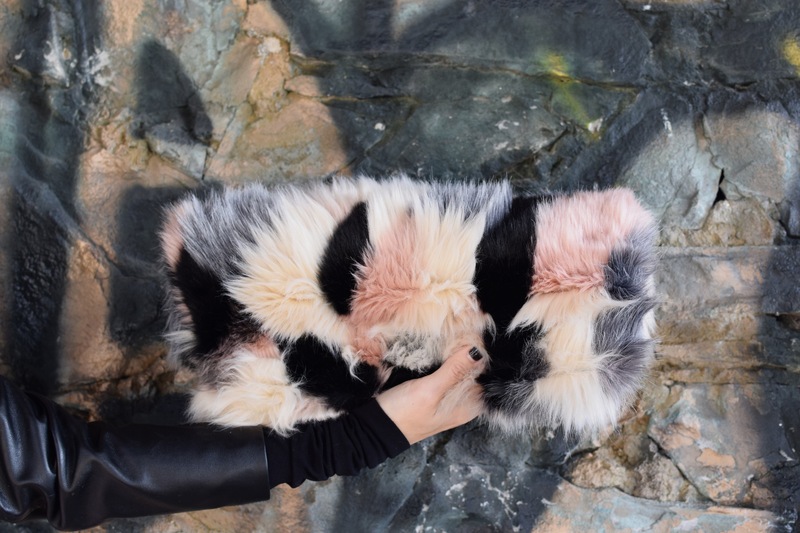 This furry baby is from ASOS and it is so incredibly soft, you could even rest your head on it if you are needing a wee break from the dance floor. The colors however, are what drew me in, the options are endless. Have fun and be unique, we only live once. The shoes. Best bang for your buck, you NEED them right now ladies. I have bought them in every color, I loved them that much. They are one of the most comfortable pair of heels I have ever worn. I even managed to climb a set of old washed out rock steps, to get the pictures in them. They fit true to size, wide or narrow, it does not matter, they will strap you in for the ride. Steve Madden, thank you. Okay, well there you have it folks, I think I may lay down now, rest my back and take off my dancing shoes, at least for now. What do you think, break dancing next! Hi Carly! I absolutely loved reading the post! You have made justice to the beautiful skirt and the jacket and the heels are complementing the overall look. The location has also accentuated your outfit shoot great. Pamela. Absolutely adore this look! Love the pink and black.